David Voice at present supervises the National Model Tram Collection. David Voice writes and publishes a range of books for tramcar modellers, most of which are listed in the bibliography and some of which can be purchased on-line from TLRS publications. Also, he writes regular articles on small scale tramway modelling the the TLRS Tramfare magazine. 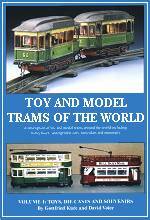 These books from David, written in conjunction with Gottfried Kure, are for the toy and model tram collector. A4 portrait card cover, 128 pages, full colour throughout. Published by Adam Gordon. This title can be purchased on-line or by post from TLRS publications. Following a lifetime of modelling and collecting small trams, Gottfried Kure and David Voice have teamed up to pool their knowledge in this definitive work describing toy and model trams, trolleybuses and underground trains from over the whole world. 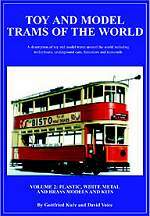 In Volume 1 the Authors look at toy trams, all die cast small trams and the vast souvenir market. The book gives invaluable tips about collecting and looking after toy trams, then covers historical tinplate, tinplate after 1950, wood, card, die cast, plastic, all other materials, souvenirs and children's toys. To help identify items there is a manufacturer's index and around 400 illustrations, mainly full colour photographs. Over 1,800 individual small trams, trolleybuses and underground trains are included and there are around 480 manufacturers name's, most entries having an historical summary. The book also guides the collector with market price estimates for toy trams no longer in production. A4 portrait card cover, 188 pages, full colour throughout. Published jointly by TLRS and Adam Gordon. In Volume 2 the Authors deal with scale model tramways. There are around 600 illustrations, all in full colour. Over 4,000 individual items are listed with market prices. Both ready to run trams and kits are covered, split into sections dealing with models in plastic, white metal and brass. There are also additional entries to update Volume 1.